In the summer of 1998, Direct Dental contracted art-i-zen.com to design godirectdental.com, a brochure-like corporate site that mimicked the looks and colors of the printed brochures. The success of the web site led to the development of a brand new business model. In 1999, Loris Scagliarini led the team that designed and produced smallbizbenefits.com, our most ambitious site to date. A complete database driven, e-commerce application for self-administered benefits plans. This web application allows small businesses to sign up and manage their own dental benefit plans completely and securely on the Internet. 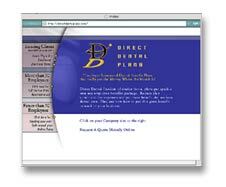 Finally, the market evolution of the project called for the creation in January, 2001 of directdentalplans.com, a hub from which one could access either godirectdental.com or smallbizbenefits.com. Following market trends which originated during the same year the site was transformed to address both corporate clients and small businesses from the same location. In addition, the e-commerce section was removed from the site and substituted with live phone support. This is a perfect example of web architecture designed to expand and compress as needed in today's ever-changing market. When you are done, just close the browser window to return to art-i-zen.com.